John Kaplan, from Harvard, has studied companies around the world and has surmised that only 10% of corporate strategies are effectively implemented. John Kotter, from Harvard, did a study indicating that companies with high performance cultures can expect 3-5 times better financial performance than their peers. 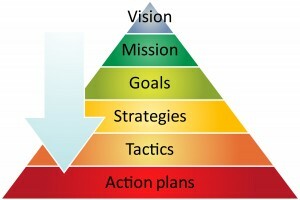 Focus every activity throughout the company on the 3-5 strategic objectives in the company’s strategic planning horizon. Develop a series of strategies and tactics focused on creating an execution mindset. Level 1: identifies the most important starting blocks and the basis from which a performance management strategy will evolve will evolve into a culture of strategic execution. The company’s understanding of their employee’s perspective and its knowledge of customer’s needs and attitudes are the underpinnings of developing tactics that will drive a company’s culture. Vision, Mission, Values and Leadership traits (most companies don’t give guidance to their leaders on how to lead), provide all stakeholders in the company guidance on how to work together and focus their efforts toward achieving the company’s strategic imperatives. Once these have been defined, the company has a higher probability of successfully implementing its strategies. Integration of major strategies such as entering new markets, implementing new systems, acquisitions or mergers are organizational activities that rely on individuals throughout the entire organization to effectively support. By setting goals for everyone (cascading objectives), that focuses their efforts on the strategic imperatives the company can leverage thousands of activities. The company must also implement a company wide system to properly measure performance and provide routine (more than once a year) feedback to everyone on how well they are doing against these objectives. Most companies rely on yearly performance appraisals for this purpose. According to a recent study, yearly performance appraisals are ineffective and universally disliked by employees, managers and CEO’s. The integration of new strategies and acquired businesses requires a well thought through plan and an effective measurement system that gives real time feedback and effective employee engagement on the company’s strategic imperatives. Level 2: continues the evolution toward a culture of strategic execution by defining “Knowledge Management” strategies for all stakeholders throughout the company. By clearly identifying the strategies for the business and utilizing an effective performance measurements (KPI’s) the company can quickly identify its operational and strategic gaps. Performance management systems such as Cascade and others need to provide leaders throughout the organization with an additional view of who is performing and aligned with the companies strategies, Mission, Vision, Values and Leadership Traits. The figure abovew provides one such example: The three key indicators: strategic gaps, operating gaps and alignment/performance provides a clear path for the Level 2 tactical activities in terms of how stakeholders in the organization need to be supported and prepared to move into level 3 which is completely focused on change management. Level 2 also introduces compensation for performance and succession planning into the mix, accelerating the performance of the entire organization. This approach yields significant productivity results (a great ROI on the company’s investment) and further reinforces the need for everyone in the organization to focus their efforts on the company’s strategic imperatives and organizational quality. About the author: Jim Gitney, CEO Group50®. Mr. Gitney has spent his 30+ year career leading organizations in large and small companies such as GE, Black & Decker, Sunbeam, Rain Bird and others. As a result, he has seen many different approaches to performance management and developing high performance cultures. He has worked with healthy or troubled companies with a focus on performance management and the implementation of high performance cultures. Group50® has developed a unique and systematic approach to performance management that takes a company through a process of identifying its core strategic and cultural objectives, cascades them throughout the organization and utilizes a new tool called Cascade that significantly increases employee engagement around a company’s strategic imperatives. For a free assessment and a discussion of how a company can create a high performance culture, you can contact Jim at (909) 949-9083 or via email at info@group50.com. 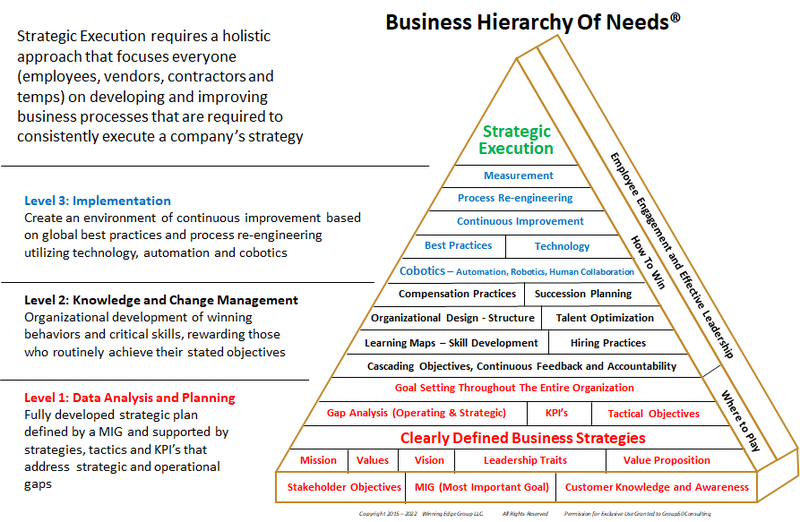 This is really an impressive and great article about business strategy. Thanks for sharing this here.